Enterprises operate in dynamically changing environments that have an influence on both business and IT areas. Capabilities have been proposed as instruments to align business and IT in such environments. One aim of enterprise modelling is a better communication between the stakeholders of an enterprise at various levels. Thus, the alignment can be facilitated by the exploitation of enterprise models as an abstraction instrument. 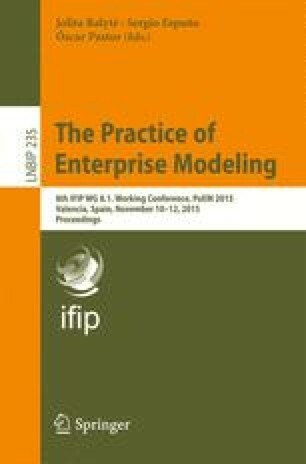 In this respective the paper analyses the methods for capability design and development from the enterprise modelling perspective by conducting a mapping study, i.e. the level of methodological support for capability modelling is investigated. For this purpose 112 journals and 24 conference proceedings were analysed. The most important findings are that the research in capability design (i) adopts empirical research, mostly in form of case studies and surveys (ii) is mainly motivated by Resource Based View (RBV) and changing environments (iii) proposes development approaches and frameworks as solution artefacts, (iv) lately receives attention in the Information Systems Development & Tools of MIS subject classification lately, (v) provides a scarce methodological support that is mostly represented as procedures and most importantly (vi) only to some extent exploit enterprise models that could enhance stakeholder communication at various abstraction levels. This work has been performed as part of the EU-FP7 funded project no: 611351 CaaS – Capability as a Service in Digital Enterprises.